Article by Niall Burke ©. 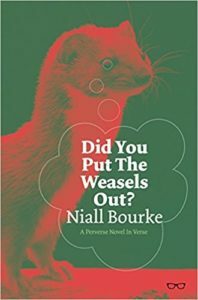 My journey to publishing Did You Put The Weasels Out? started a nearly 4 years ago. I was 32 at time and, for many years, I had wanted to be a writer. Well I say I had wanted to be a writer but, to be honest, I’d never really done much about it. I had made some very, very half-heated attempts to start writing – maybe a handful over 10 years; a page here, or a poem or opening of a short story there – but whenever confronted with the reality of actually sitting down and writing I’d given up. I mean it was hard. And it was lonely. And invariably I’d find something else I’d rather be doing. So I suppose that when I say I wanted to be a writer what I mean is that I wanted to have written but didn’t want to actually go to the bother of sitting down and writing anything. However, just before I tuned 33 I decided I’d do something about this. There was no specific epiphany that I recall, but my work brought in a scheme offering to pay half for anyone who wanted to study an MA. So, in a bid to rectify my writing malaise, I signed up for a part-time creative writing MA at the Goldsmith’s University of London. At this point it’s worth saying that Creative Writing MA’s are certainly not a pre-requisite to learning to write or getting published, and – even with partial funding – they can still be prohibitively expensive. But personally I needed the structure and direction that a taught creative writing course provided; somewhat I guess like marking lines of play on a sports pitch to stop players running off in all directions and force them to move towards the goal. It was during the MA that I started working on Weasels. Although my early drafts look nothing like what became the final version. Over the course of my reading I came across a (possibly apocryphal) story attributed to W.H Auden. When Auden was headmaster at Gresham’s School, one of his students expressed a desire to become a poet. Auden asked the student why, to which the student replied that he felt like he had a lot to say. Auden said ‘it would have been better had you simply said you liked words’. And this, in ways, seemed to mark a turning point in my ideas about poetry. Poetry, I realised, must be about words and, by extension, uncertainty. Words, by their very nature, are always in a state of flux as they bounce back between writer and reader, speaker and listener. So poetry must, before it attempts to do anything else, celebrate the playfulness and uncertainty of language and, therefore, the playfulness and uncertainty what it means to be alive. I realised that the poems I had been writing before were tepid. They took themselves too seriously, with erudition trumping enjoyment. They were esoteric, staid and what I might call very ‘poemy’. They were a laboured and exacting (but ultimately uninspiring) diagram of what poetry ought to look like, trying to say too much and asking too little. They often had italicised sub-headings under the titles saying things like: ‘after Chekhov’, and ‘for Wallace Stevens’. There were a lot of classical or what could be called ‘learned’ references (Heraclitus, Berkeley, Kant) And my language was also what might be called very ‘poemy’: essence, huge sublimity, amniotic beams, scorched, transfused, illuminations, solace, epoch, ponderosa, hue, azure, mastication, dark as slate, slate-dark, epicene, iambs. 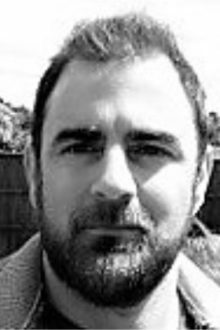 Many of my poems were epipahinical or near-epiphanical moments (on buses, looking at the sky, while driving), epigrammatical snapshots of pastoral scenes (donkeys, cats, fields) or responses to artists or writers or figures in literature. Now there is nothing inherently wrong with any of this this. And some poets do it very well indeed (I mean, just think of Elliot and Heaney). But, for me, it just wasn’t working because I was simply putting these things as gaudy decorations, putting them in because I thought that was what a poem was supposed to have. The next (and very formative) thing I came across was The Golden Gate by Vikram Seth. This really encapsulated for me what poetry centred on the playfulness and uncertainty of language could become. It is a novel written in verse that charts the trials and tribulations of a group of thirty somethings in 1980’s San Francisco. It is written exclusively (including dedication and contents) in sonnet form, a form of sonnet called the Onegin (or sometimes Pushkin) sonnet. This is a form of sonnet invented by the Russian poet Alexander Pushkin and used in his seminal novel in verse ‘Eugene Onegin’. It is written in tetrameter and has an unusual rhyme scheme (AbAbCCddEffEgg – where the capital letters denote a ‘feminine’ rhyme with extra unstressed syllable and the lower case denote a ‘male’ rhyme.) It was the most fun thing I had read in a long time. As Stanley Mitchell explains (in his introduction to his recent translation of ‘Eugene Onegin’) the tetrameter brings with it an inherent ‘lightness’ – and this lightness and playfulness is what attracted me to the Onegin stanza. But it seemed to me that that rhyming and lightness of The Golden Gate had somewhat fallen out of poetic fashion so I decided that, in response, I wanted to write something that paid homage to The Golden Gate but something that was also ‘new’ and had rhyme, lightness and uncertainty at its heart. So I decided on a perverse novel in verse. The Onegin sonnets proved to be rather difficult. They were often creaking under the combined weight of having to advance the narrative, develop a sense of character and also be poetic in their own right. Editing became fiendish because changing even one word for the sake of the narrative meant disrupting the meter and the rhyme scheme (and vica-versa). There was an ever-present battle for dominance between the form and the narrative. I considered dropping the Onegin constraint for a while but, after discussions with my tutor, hit upon a novel (or perhaps novella) solution. I decided to use footnotes to explain parts of the narrative. This helped lift the strain from the Onegin sonnets and allowed them to ‘breathe’ as poems in their own right, but also allowed for a self-referential and uncertain playfulness in the text. And thus, after over three years drafting and editing, The Weasel was born. About Did You Put The Weasels Out? Sometimes, through no fault of anyone else, I find myself getting bored of knowing what to expect when I pick up a new collection. It takes a radical formal gesture to really refresh things, and that s what I found in Niall Bourke s Did You Put the Weasels Out? A surreal Onegin, endlessly, viciously playful, reinventing itself in every sonnet and sonnet-footnote like a linguistic Mandelbrot set. And what might have come off as a sophisticated but purely academic exercise is instead governed by a scabrous, self-effacing wit and a deep sense of love and its absurdity, which anchors every flourish into prose poetry and free verse and runs throughout the appendices and index. It s a debut so energetic, so bursting with ideas and insistent music, it reminds you why you started writing in the first place and, whether you like it or not, that you won t be able to stop. Born 81, in North Kilkenny, lives in London, SE 4. Likes and loves? Large and many: weekend coffee, poky bookstore, friends, laughter, his wife and daughter, swimming slalom through life s whitewater. Works as a teacher, thinning hair. Dislikes? If pushed, will declare distaste for the growing global race with man 'gainst fellow Wo and Man and the Devil take the also-rans. And how to end? With ignoble grace: stretches, yawns, scratches his head, sheathes his pen, goes off to bed.